Dehydration from diarrhea, regardless of cause, kills approximately 700,000 children annually, mostly in developing countries. There is currently no reliable means of determining the exact severity of individual cases of dehydration. This is important since over-treating a mild case of dehydration can cause just as many problems as undertreating a severe one. Researchers from Brown University hope to change this with study findings that look at the effectiveness of diagnostic tools. The diagnostic tools were derived from the cases of 771 children, between the ages of zero to five years, from Dhaka, Bangladesh. The system, named “Dehydration: Assessing Kids Accurately” (DHAKA), is composed of both a scoring tool and decision tree that can quickly be applied when a young patient arrives at a clinic or hospital. Both components are based around relatively simple signs that don’t require special equipment to observe. Devising such a system is trickier than it sounds, since an effective diagnostic tool must be able to both identify the condition reliability (sensitivity) but also rule out other possibilities (specificity). The assessment tree is a two-step flowchart that begins with looking at the child’s appearance. If they appear normal, the eyes are checked. Normal or slightly sunken eyes mean no dehydration, while very sunken eyes indicate severe dehydration. For children who look irritable or lethargic, the tree instead moves on to a skin pinch test. As the name suggests, the skin is pinched and how long it takes the formed “tent” to fade is measured. A normal time indicates moderate dehydration and a slow time means severe dehydration. The scoring system is a tally of four visible signs: general appearance, respiration, the skin pinch test, and tear production. The degrees of each sign are added up into a DHAKA dehydration score that, in concert with the assessment tree, form the basis of the evaluation. When analyzed to see how predictive the tools were on dehydration severity, the DHAKA score rated 83% sensitivity for severe dehydration and had a specificity of 57%. The assessment tree rated with a sensitivity of 81% and a specificity of 67%. An additional round of clinical trials was performed over the spring, with the results currently pending. If the results prove positive, it is hoped the DHAKA system will become part of standard care. The DHAKA system is not the first attempt to devise quick clinical assessments for dehydration severity. In the past, however, such methods have not proven any better than random chance. 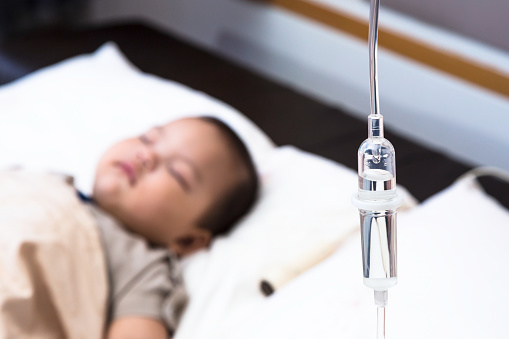 “DeHydration: Assessing Kids Accurately (DHAKA),” ClinicalTrials.gov, https://clinicaltrials.gov/ct2/show/NCT02007733, last accessed August 21, 2015. Orenstein, D., “New diagnostic tools for dehydration severity in children,” Brown University web site, August 21, 2015; https://news.brown.edu/articles/2015/08/dhaka.